Sadie received a gorgeous new portrait recently and it is fantastic. The style is whimsical, the colors are so vibrant, and the likeness is striking. I could gush on and on about how in love I am with this portrait. But instead I’d rather tell you about the wonderful company that created Sadie’s portrait – Andy’s Paw Prints. 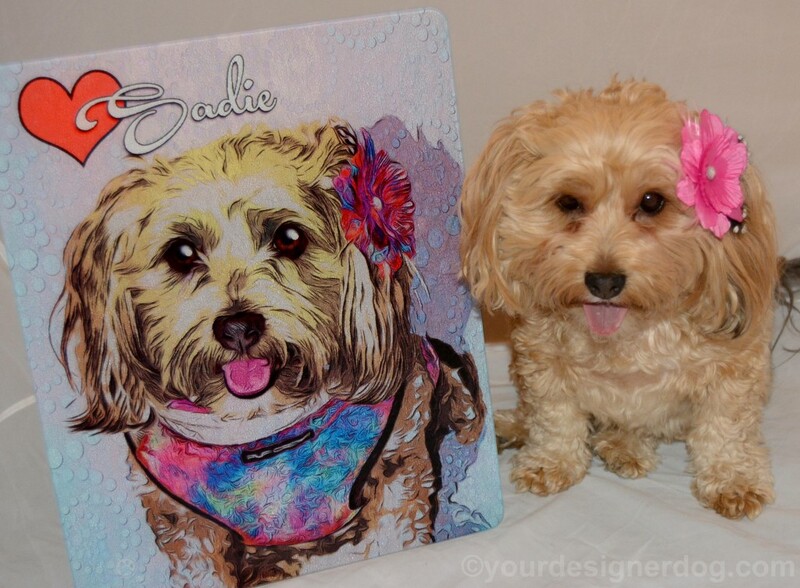 Andy’s Paw Prints creates custom pet portraits based off of photos of your pet. These portraits are all created digitally, meaning they are hand drawn on a computer rather than a canvas. There are six portrait styles you can choose from for a pet portrait: true to life digital painting, rustic, rescue, pop art, charcoal digital drawing, and colored pencil digital drawing. For Sadie’s portrait I chose the pop art style. The pop art style allows the artist to be more creative with a portrait, especially in regards to color. I thought this bright, fanciful type of art was perfect to capture Sadie’s personality and would fit well with the decor of our home. But if pop art is not for you, Andy’s Paw Prints offers both more traditional and more unique portrait styles. The rustic style, which makes the portrait appear to be painted onto wooden planks, would be great for those who love country chic decor. You can also request a rustic portrait with an American flag background, perfect for veterans and those who love their country as much as their dog. Personally I was also very drawn to the rescue style portraits, which are both realistic and unique. On the rescue portraits the background around your pet is filled with all the words the make your pet special, such as their breed, personality traits, devoted, loyal, etc. The only reason I did not choose the rescue style is that the background colors are a bit too neutral to fit my personal aesthetic. Sadie was definitely a better fit for pop art, where her beloved pink colors could shine through. If artistic talent isn’t enough to make you want a portrait from Andy’s Paw Prints, you won’t be able to resist when you hear about the charitable portion of their business. With each and every purchase you make, Andy’s Paw Prints donates 25% to help animals in need. And it’s not just a donation to some nameless charity that you don’t know anything about. You can actually choose which shelter/rescue/charity receives the donation from each purchase you make. Andy’s Paw Prints takes the time to actually partner with shelters and rescue organizations to make sure your donations are really getting to those animals who need it the most. If you have a particular shelter or organization you love to support and it’s not on the list, you can even fill out a form to start the process of getting your organization added to the donation list. 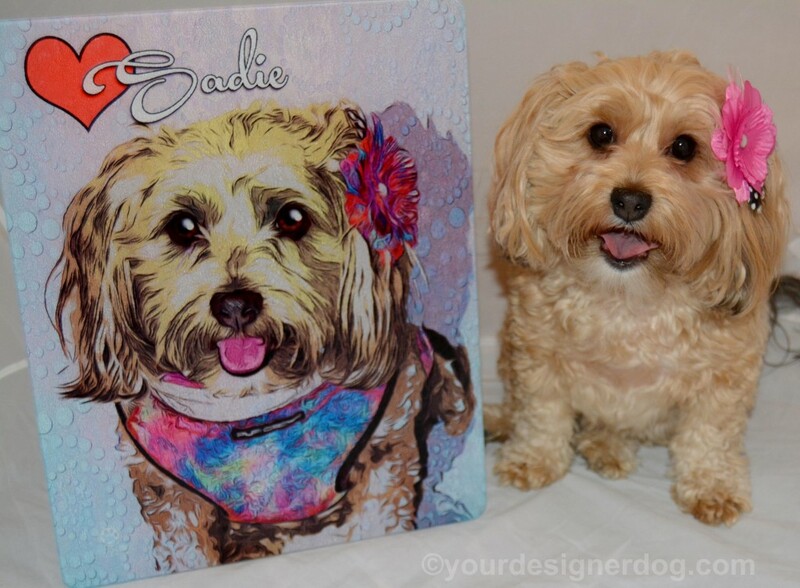 You may notice in my photos that Sadie’s portrait is not on the typical canvas or paper of a typical piece of art. That is because Andy’s Paw Prints offers you some unique options in the format of your portrait. For your initial portrait purchase, you can order a canvas print, a print on foam board, or even have the portrait printed on ceramic tile. Once your portrait order is complete, you are then given the opportunity to order additional copies of your portrait on items that can be useful as well as decorative. I chose to have Sadie’s portrait printed on a glass cutting board. I think the shine and texture of the glass makes the pop art portrait almost come to life and I smile each and every time I walk into my kitchen and see it. 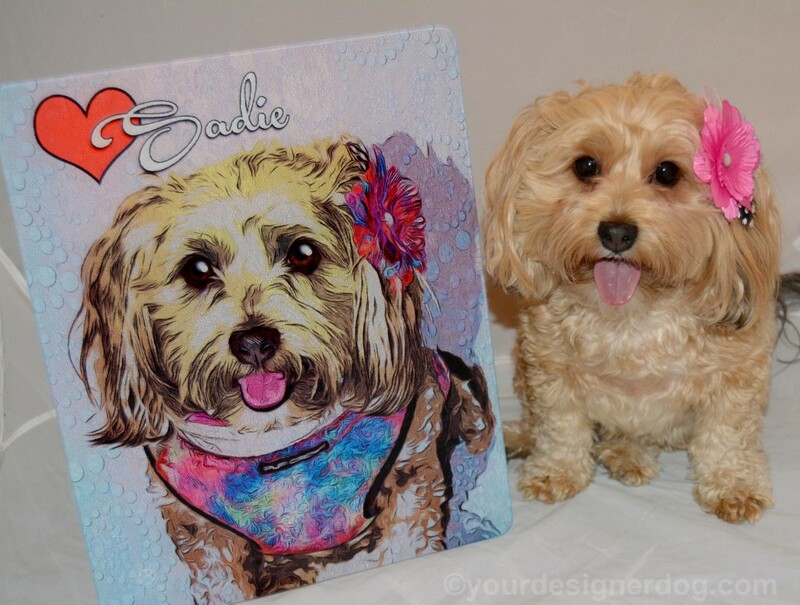 The cutting board itself is super high quality, larger than your average cutting board (looking at my photos you will see that the cutting board makes Sadie’s portrait life size), and has the little rubber feet to keep it safely in on your countertop. Some of you may think it’s odd that I want to chop vegetables on my dog’s face, but for me it makes kitchen chores less tedious when I have something gorgeous to look at. In addition to cutting boards, you can also purchase additional copies of your portrait on mugs, mouse pads, and coasters. Getting your own pet portrait from Andy’s Paw Prints is easy. You just need to pick your preferred style, fill out the form, choose the charity your purchase donation goes to, and attach a few good quality photographs of your pet. After you pay a small deposit fee, an artist will immediately begin work on your pet’s portrait. Once it’s finished, you will receive an email link to see the finished masterpiece. 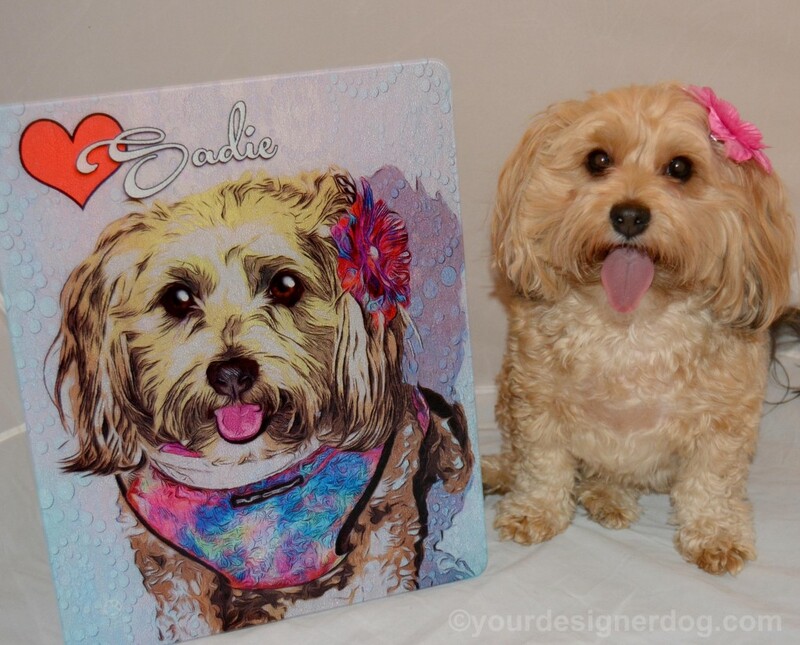 You get to choose whether to order canvas portraits, tile portraits, printed portraits, etc. Prices range from $45 to $195 depending on the style and medium and you will be able to deduct the price of your deposit from your final purchase amount. 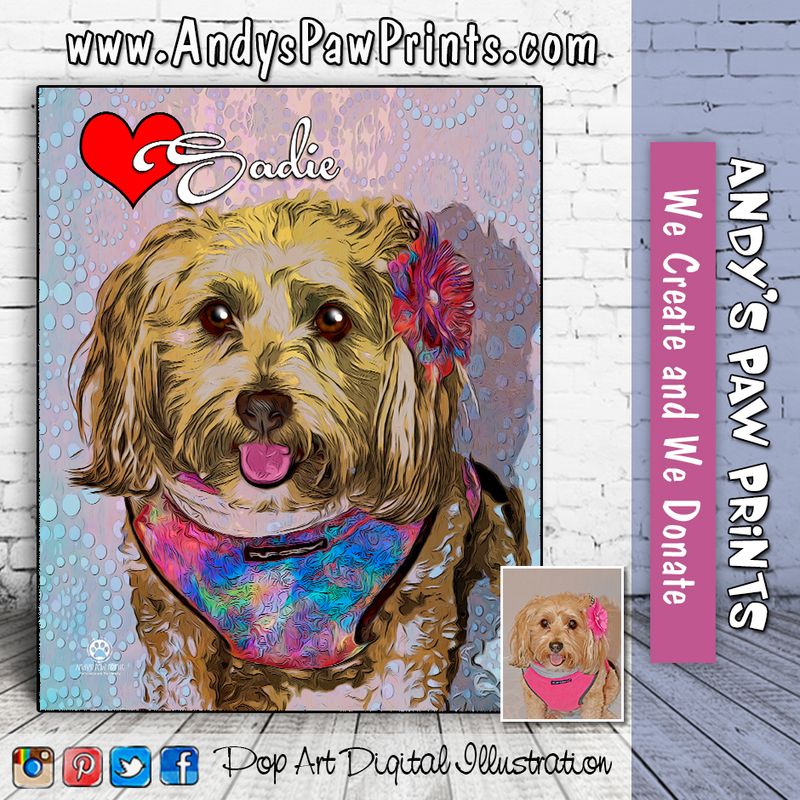 At this point your portrait will also appear in the before and after gallery on the Andy’s Paw Prints website, where you can share your portrait with all your family and friends through email and social media. Head over to Andy’s Paw Prints where you can see all of their beautiful portraits and order one of your own. I received a free product to try out in exchange for my own opinions in an honest review. I love the colors in the portrait! It’s nice that they donate too. That is so cool! I can’t believe how spot on the pet portrait was. Super adorable. I need to do a portrait like that for my dog. The one you’ve shown is absolutely amazing in its accuracy. That is so cool! I need to send in the picture of both my dogs that have passed away, so that I can get a beautiful painting of both of them. The portrait came out really great. Love it! Thanks so much for sharing on the hop! Aww, how cute. A custom painting would be an awesome keepsake. I just love all of the colors in yours. How cool is this. I love the way it came out. My daughter would love this portrait. OMG. So cute. It’s so funny because my sister is obsessed with MY dog so I would totally do this for her. She would love it. This would be a great gift idea. I would love a photo done of my dog. That is such a great portrait! I think a lot of people love their animals enough to have these done. I would love to have one of my shepherds! How cute are these! There are so many of these out these days and they really look sao authentic! I love this so much. What a great portrait of your sweet Sadie, that’s a keepsake for sure. i love that they donate 25% to charity for the animals, that is great. are the paintings done by hand, or by computer? Wow, that is one awesome custom portrait. They did a wonderful job. Oh wow, thaty is one gorgeous painting/portrait. Sadie is beautiful! Awww I really love this. It’s great that they make charity donations. I’d love to have a print of Peanut and I’m sure my mom would love to own one of her little furry family members. Aww it melts my heart you dog’s photo with pink flower really makes my day. I would want a portrait for my cat too. This is so neat and sentimental. That really is one of the nicest portraits I’ve ever seen. I can see why you love it so much!